IMPORTANT: Because this is a mobile / responsive design, these images will adjust to the size of the screen. This means that there is not a hard-coded image size, and the “Automatically resize this image” checkbox wont really do anything. It will resize to the dimensions of the layout. Q: What if I want to use a banner that is 960px wide by 200px high? Or maybe 960px wide by 100px high…. Will it display? A: Yes it will, and it will scale properly at the smaller sizes. 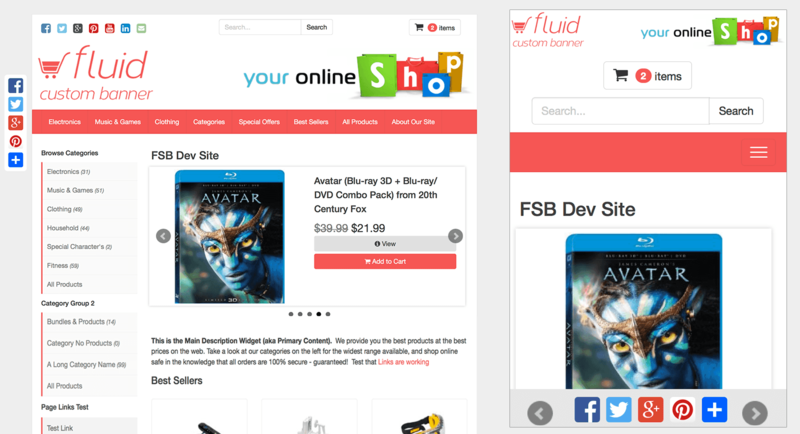 The most important thing is to get the correct 960px width for the custom banner header. Q: What if my logo is smaller than 445px wide by 120px high? A: It will still display properly. Fluid has been built from the ground up to work with mobile devices. Images are setup to be responsive, sidebars are repositioned as needed for mobile devices & buttons and menus are touch activated. We also used all the latest design techniques, including stacked font icons (see the credit card icons in the footer) in order to keep your site fast and mobile friendly. 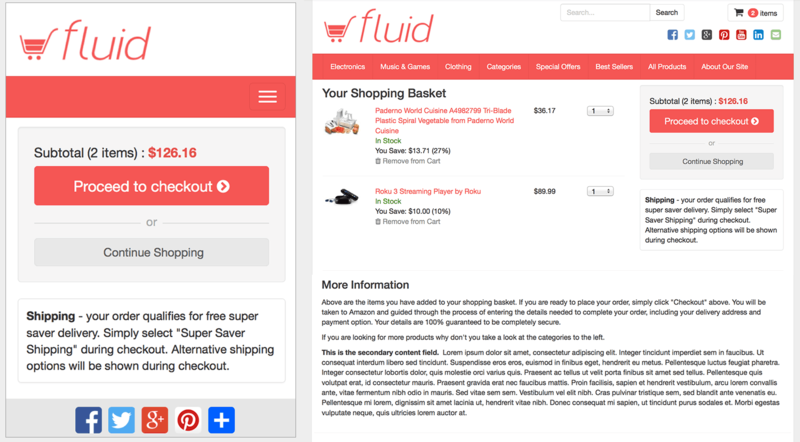 We also redesigned the Basket and Checkout pages based on mobile eCommerce best practices, to help combat cart abandonment and get your users to do the most important thing – purchase your products! We implemented Social Sharing utilizing the AddtoAny script. When displaying on larger tablets (iPad 768px) and desktops, these will display as Floating buttons locked to the side of the screen. For smaller tablets and mobile phones, this automatically switches to a nav bar fixed to the bottom of the device. There are a couple of reasons we chose AddtoAny, as opposed to other available scripts. First and most importantly, the features for Floating buttons and the Mobile fixed navigation bar were available for FREE! You do not have to sign up for any service or pay any fees, unlike other social sharing scripts. In addition, AddtoAny automatically integrates with Google Analytics – no additional coding or fees required. The code is also very fast loading, and supports SSL. And lastly, Fluid absolutely supports the latest version 5.0 Facebook features, so make sure you read up on those and take your social marketing to the next level! To make this really easy – we’ve included code so that all you have to do is put a wrapper around your video code and it will automatically become response and maintain it’s aspect ratio!